Ozzie Smith and Tom Niedenfuer, forever linked by a home run, were involved in a couple of other notable encounters before their infamous 1985 postseason showdown. Though the home run was the most important swing of Smith’s Hall of Fame career, it wasn’t the first time he delivered a key hit against Niedenfuer. One of those hits produced an unusual double play. 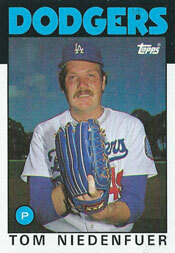 Another helped cause a meltdown by the Dodgers bullpen, foreshadowing the drama that would unfold in the 1985 postseason. On Sept. 1, 1982, the Cardinals and Dodgers were in the 11th inning of a game at Los Angeles, with the score tied at 5-5. The Cardinals had Tommy Herr on second base and George Hendrick on first with one out when Smith stepped to the plate, facing Niedenfuer. Smith looped a single to right field. As Herr and Hendrick advanced, right fielder Pedro Guerrero made a strong throw to the plate. Herr, uncertain he could score, held at third. Hendrick, expecting Herr to head home, rounded second. When he saw Herr on third, Hendrick applied the brakes. Guerrero’s throw to catcher Mike Scioscia was on target. Scioscia caught the ball and, seeing Hendrick take the wide turn around second, fired a throw to second baseman Steve Sax, who tagged out Hendrick as he tried getting back to the base. When Herr saw Scioscia throw to second, he took off from third. Sax threw back to the catcher, who blocked the plate as Herr went into his slide. Scioscia caught the ball and tagged out Herr, ending the inning. Instead of resulting in the go-ahead run, or at least loading the bases, Smith’s single off Niedenfuer resulted in a double play. “Strange double play, all right,” Cardinals manager Whitey Herzog said to the Associated Press, shaking his head. “I’ve managed about 2,000 of these games and I have never seen one like this,” Herzog said to the Daily Breeze of Torrance, Calif.
Two years later, on July 8, 1984, Smith contributed to a Cardinals rally against Niedenfuer at Los Angeles. The Dodgers entered the ninth inning with a 6-2 lead. With one out, Willie McGee and Darrell Porter both singled against Dodgers reliever Ken Howell. Niedenfuer relieved and the first batter he faced, Andy Van Slyke, hit a three-run home run, cutting the Dodgers lead to 6-5. “Even after he hit it out, I still thought Tom would shut them down,” said Dodgers pitcher Orel Hershiser. Instead, Smith followed with a single, knocking Niedenfuer from the game and keeping alive the Cardinals’ comeback hopes. Hershiser relieved and struck out Mike Jorgensen for the second out of the inning, but Lonnie Smith singled, advancing Ozzie Smith to second, and Herr also singled, driving in the tying run. In the 12th, the Cardinals scored twice off Pat Zachry and won, 8-6. In 1985, Ozzie Smith was 0-for-4 for the year versus Niedenfuer before corking his Game 5-winning NL Championship Series home run _ his first batting from the left side. For his career, including regular season and postseason, Smith batted .353 (6-for-17) against Niedenfuer, with four singles, a triple, a home run, three walks, two RBI and no strikeouts. In April 1990, Niedenfuer was released by the Mariners and signed with the Cardinals, becoming a teammate of Smith. “We’ve got to give him a job after all he’s done for us,” Herzog told the St. Louis Post-Dispatch. When Niedenfuer entered the Cardinals’ clubhouse for the first time, first baseman Pedro Guerrero, his former Dodgers teammate, introduced him to Smith. In 52 games with the 1990 Cardinals, Niedenfuer was 0-6 with a 3.46 ERA. You do great work here. I don’t always comment, but I always read. You made my day with your kind comment. Thank you for your loyal readership.